To download from newsgroups, you’ll need a Usenet newsreader client or a newsgroup browser app. We outline some of the best choices available today and also cover settings and Usenet connections. So many newsreaders & Usenet browsers to choose from. What is a Usenet Newsreader? BTW, this post assumes that you have already researched and found the best Usenet provider for your particular budget and needs. When you want to access the web, you need a web browser like Chrome, Firefox or Safari. When you want to check your emails, you need an email service like Gmail or email app such as Outlook). And for enjoying torrents, you need a torrent client like uTorrent or QBittorrent. For Usenet? It’s the same story. 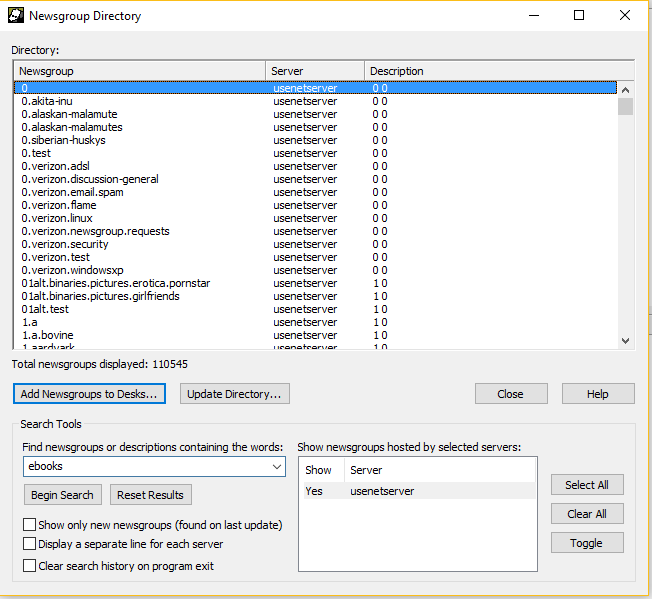 Newsreader software (sometimes called a Usenet client) or Usenet browsers apps let you connect to a Usenet server, access its newsgroups, and download its posts and files. Without a newsreader app, well, you can’t do much. We also cover how to set up your newsreader including Usenet connections (a setting in your newsreader software) to clear up some common confusion about them. What's the Best Number of Usenet Connections? What to Do About Slow Usenet Speeds? You’ll sometimes see Usenet newsreaders called “Usenet clients” , “Usenet browsers” , “newsgroup readers” or even “newsgroup browsers”. In addition to using its own software and apps, Usenet also uses its own protocol, NNTP, which stands for Network News Transfer Protocol. It’s the Usenet equivalent of web browsers using HTTP, email using SMTP and torrents using P2P. But if you’re just finding out what a newsreaders app is (or you’re new to the whole thing, in general), you might not know which one to use. Not a problem, because we’re going to get you set up with one of the best. Our recommendations are presented below, but there’s something we have to explain first. Adding somewhat to the learning curve of coming to understand newsreader apps is that some Usenet providers (the folks you get your newsgroup access from) will include a free, in-house or “bundled” newsreader with their service. For this reason, we divide our recommendations into these two groups, bundled apps (next) and standalone clients (further down the page). These options are best if you have not yet signed up for Usenet access and are looking for a free newsreader included with a Usenet subscription plan. Topping our list is Newshosting’s in-house browser, which comes free with any Newshosting subscription. Newshosting has a risk-free 14-day trial so you can give it a whirl. What do we like about it? Well, it does pretty much everything you need it to, from full Newsgroup search and video previews to NZB support. It also features an auto-shutdown, plus a graph that displays your download speeds. Newshosting's Free Usenet Browser Newsreader is packed with features. Newshosting’s Usenet newsreader also has the fastest search function we have ever seen. The only drawback with this particular Usenet browser is that it’s only available to Newshosting users. We highly recommend Newshosting ourselves, but if you’re already set up with another Usenet provider, their newsreader will not be of any help to you. 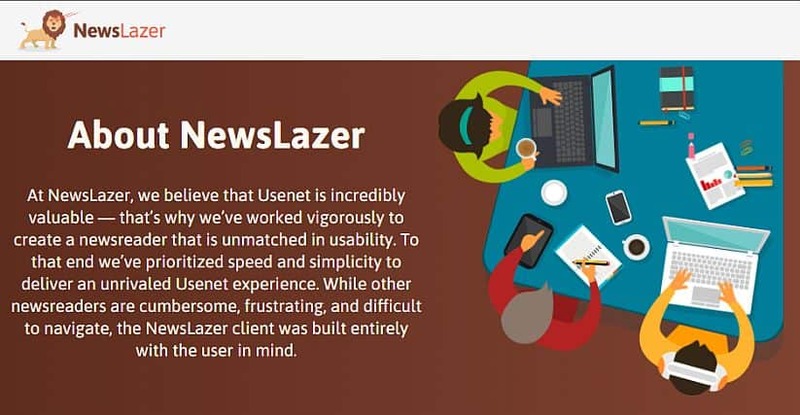 NewsLazer is the free newsreader that comes with any Eweka Usenet subscription plans. In other words, you will need an Eweka username and password to use NewsLazer. The Newslazer newsreader comes free with an Eweka plan. Usenet Wire is the newsreader you get for free with any Tweaknews account. Only Tweaknews subscribers can use Usenet Wire. automated search & save let's you set what files you are looking for in advance, automatically run the search and then download the results. Sweet! search previews for images, audio and video help you make sure you are downloading the correct files you want. 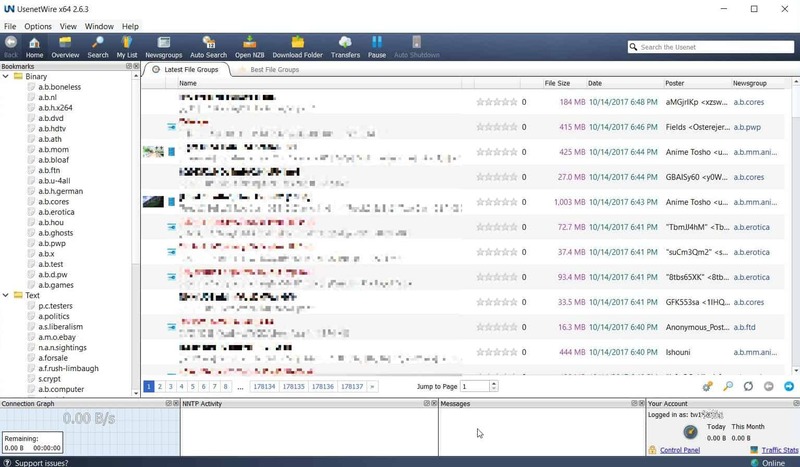 integrated star rating displays give you confidence that the files you are downloading are of good quality. automated unpacking and repairing mean you can say good-bye to incomplete file transfers. Here's a screenshot of the main view in Usenet Wire. Usenet Wire is a free Usenet newsreader included with Tweaknews plans. These options are best if you already have Usenet access and are looking for the best way to download from newsgroups. NZBGet has recently overtaken SABnzbd (below) as the best Usenet newsreader software. It's 100% free. Another reason it is so popular is due to how compatible it is with various devices and apps. It is very well supported and frequently updated. This ensures it works well with leading NZB indexers, making it the best choice for completely automated Usenet downloading. NZBGet downloads files fast and efficiently. Check out out our NZBGet how-to tutorial which walks you through installing and setting up the software and integrating it with a popular Usenet indexer. For those of you who love saving money, another free option is SABnzbd. Like NZBGet (above), it can be integrated with many NZB index sites and download Usenet files automatically. SABnzbd has a strong and loyal user base, so it is easy to find tutorials and get support from its active community. SABnzbd free Usenet newsreader (select to enlarge). It’s browser-based and operates inside of your web browser, meaning it can be used on Windows, Mac and even Linux without a problem. Firefox and Chrome extensions make the process even easier, and you can even use your Android or iOS device to manage your downloads remotely. SABnzbd is also easy to use with Usenet apps like Radarr, Sonarr, CouchPotato, Sickbeard and more. 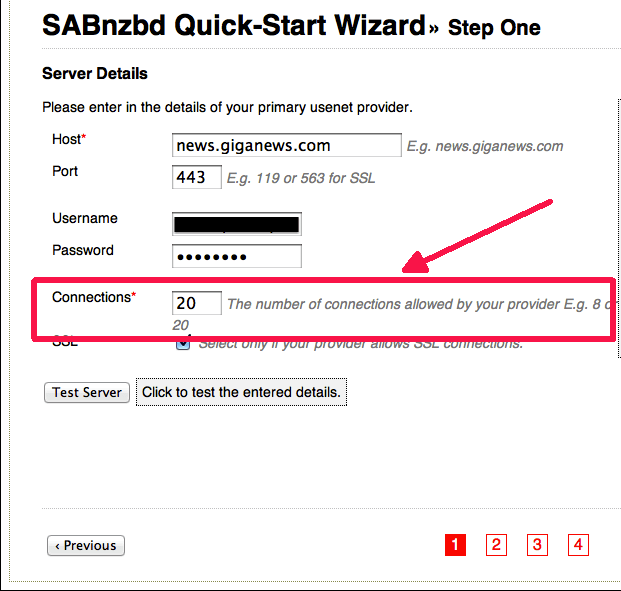 Unfortunately, SABnzbd is not the most user-friendly newsreader if you’re new to Usenet. If price is a concern, you’ll love this next entry on the list. That’s because it’s completely free. GrabIt is great for users who mostly download binaries, since the newsreader lets you preview articles to find out which messages and binaries are complete. This can save you from wasting a lot of time and bandwidth on incomplete files. It’s also got a cool batching feature, that lets you prioritize specific downloads, pause all of your downloads, or even set your device to shut down after the batch is finished downloading. 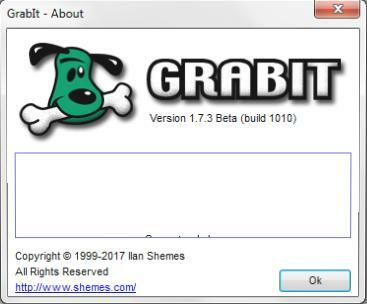 The only drawback to GrabIt is it’s more suited to advanced users who already know what they’re doing. New users won’t find it nearly as intuitive as the bundled newsreaders at the start of our list. You really can’t go wrong with the Agent Usenet newsreader. It’s effective and easy-to-use for both binaries and text-based newsgroups, making it a great choice for Usenet newbies. Of course, there are plenty of vets who enjoy it too, especially for its appealing interface. There’s also a solid automation feature that lets you set a bunch of tasks to take place automatically while you’re away from the computer or just off in another window, eliminating the need for micromanagement of your many downloads. Unfortunately, Agent is only free for the first 30 days – after that you have to shell out $29 if you want to continue using it. You’ll need to enter some basic info into your newsreader app to get set up. That includes a special Internet address for your news server of choice, which is often in the form of news.example.com. It’ll be specific to your Usenet provider. If you’re using one of the free bundled newsreaders that come with a Usenet subscription the settings will already have been taken care of for you (they come pre-set) and you can just start downloading right away.
! Warning ! – Don’t try posting (uploading) to Usenet unless you know what you are doing! Please read all of our Usenet guides before attempting to post messages to Usenet newsgroups. Many newsreader apps will also ask you for a little personal information, like your name and email address. But if you value your privacy, don’t use your real info. Either leave them blank or make something up and enter a fake name and email. Once you’ve gotten that stuff out of the way, you’ll be able to connect to your news server. At this point, your newsreader app will download all of the newsgroups that are available from the selected server. This may take a while, so be patient. It only takes a long time the first time. After that, your newsreader only updates the newsgroups list. Now, you can start subscribing to whatever you want to from the list. Most newsreader apps also let you search through the list of available newsgroups by keyword. This lets you quickly find and subscribe to groups that you’re most interested in, such as the alt.binaries newsgroups. These instructions will change a little depending on what Usenet provider and newsreader you’re using, but most of them provide detailed guides to help you out. For a quick taste of the newsgroups available, check our Newsgroup Search article​. Surprise! Entering the maximum number of connections supported by your Usenet provider into your newsreader might not always be the best way to maximize your download speeds from newsgroups. There’s a lot of talk about Usenet “connections”, but not a lot of people actually understand what connections are and how they affect your Usenet experience. 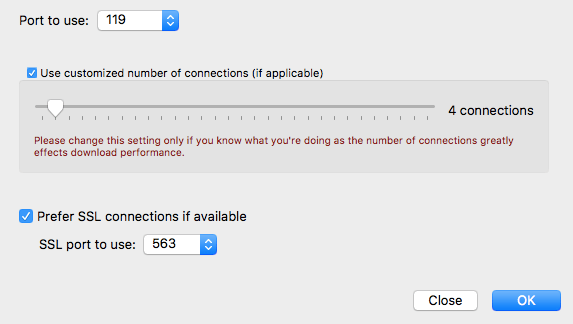 For instance, some providers give you up to 60+ connections, while others might only allow you 4. Do you need 60? What are you missing out on if you have 60 instead of 30, or 30 instead of 4? After all, those connections don’t usually come free. In most cases, the more connections you get, the more you pay. So, what is the best number of Usenet connections? Well, that answer is it’s not as easy as simply saying, the more the more better. Unfortunately, there isn’t a one-size-fits-all solution. The truth is, it depends on your Usenet provider, your internet service provider, and other factors. First things first, let’s take a quick look at exactly what Usenet connections are and what they do. Usenet connections are like separate processes, threads or streams that take place every time you download from newsgroups. When you start to download a larger file, a connection will download the first part or article of that file. And once it’s done, it will request another part. But there’s a slight delay between when a connection finishes downloading a part and when it’s able to start a new one. All newsreaders will let you enter the number of connections to use. That’s where multiple connections come in. While one connection is waiting to download its next part, another connection is still busy downloading a different part. And when you have say 60 connections, this means 60 different parts of a file can be downloaded simultaneously. That means you’re better utilizing your bandwidth and getting the fastest downloads possible. Of course, there are limits to how many connections you can use. As we mentioned, some providers give you as few as 2 or 4, while others might give you up to 60. But getting the fastest Usenet downloads isn’t as simple as just using as many connections as possible. Quite the contrary. In many cases, you DO NOT want to use all of your available connections. For instance, if you have a slower internet connection, using 60 connections is probably going to be a bad idea. 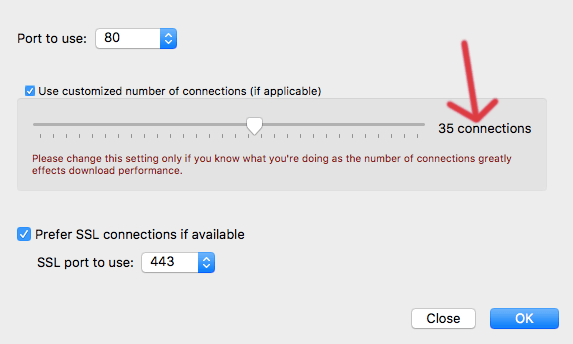 On the other hand, someone with a very fast connection could benefit from all those 60 connections to get the most from their available bandwidth. Star with a low number of connections in your newsreader. So, how do you find out how many connections are right for you? Start with a low number of connections, like 1 to 4. Then, monitor your speeds for around 15 minutes. Then add connections. Does your download speed go up or down? Wait 15 more minutes and add a few more connections. Why 15 minutes? Each Usenet provider will vary, but 15 minutes is a good guess as to how long it may take your Usenet service to recognize and adjust to the updated number of connections. Play with the number of connections until you hit your sweet spot. Eventually you’ll find that sweet spot that maximizes your available bandwidth as much as possible. Once you determine the sweet spot number of connections for your Usenet setup, increasing the number of connections will lower your download speeds – but so will decreasing it. Unfortunately, there’s no perfect number. 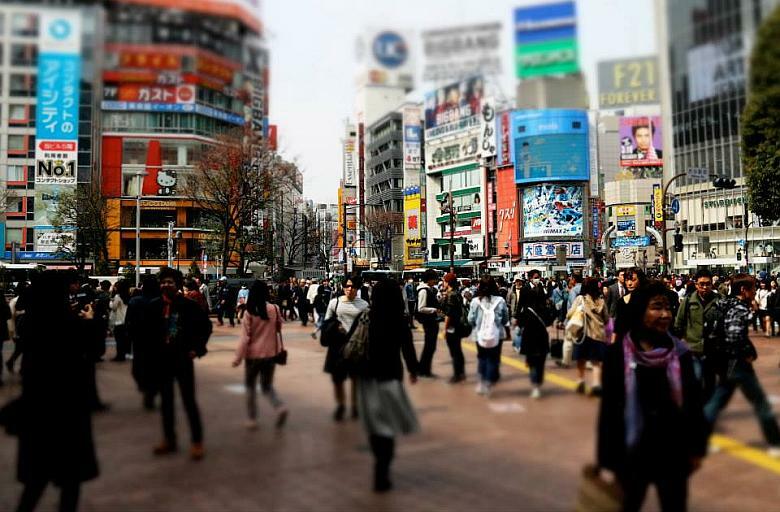 It will depend on a number of factors, including your internet connection, your Usenet provider, the current level of traffic on the news server (which itself may depend on where it is located, the day of week or even the time of day), and more. If you’re suffering from slow Usenet speeds, the number of connections you’re using may be the culprit, so it’s the first thing you should check. Use the steps outlined above to troubleshoot and find the ideal number, whether it’s 5 or 50 – but always make sure to stay without the limit set by your Usenet plan. For example, if your provider caps you at 20, don’t use 30 – this will usually cause an error, backfire and slow you down or even grind you to a halt. Does the Usenet provider you’re using have a low number of connections? It may be worth trying a service with a bigger allowance, especially if you have a fast internet connection. Of course, no matter which newsreader app you choose, you’ll need a Usenet provider to use it with. And the satisfaction you have with your newsreader app will depend a lot on your Usenet provider. A crap provider = crap Usenet newsreader experience. To make sure you are getting the best Usenet experience possible, check out our take on the best Usenet provider, with Newshosting and Giganews both being solid choices. We’ve even got some exclusive discounts for our readers. Grab one today!